The notion of sportsmen and sportswomen being deemed worthy role models for our children has taken such a battering over the years that you wonder why some people still persist with it. Tyson Fury was one of the more recent, glaring examples of how daft the whole concept can be. The boxer might be heavyweight champion of the world but he has a very strange view of it. Fame and success might bring money and profile, but not always respect. You need something extra for that. In the grand scheme of sport's descent into the gutter, Fury is a relative innocent. From cheating athletes to corrupt sporting teams and nations to institutionally crooked associations, so much has poisoned professional sport. But then along comes somebody who inspires awe for all the right reasons and makes you refocus on the good guys rather than the bad. The admiration for Andy and Jamie Murray at the Australian Open - and beyond - is vast, but it is the life story of Helensburgh's Gordon Reid that stands out above all others, even if he's never likely to get a fraction of the attention of his more glamorous countrymen. 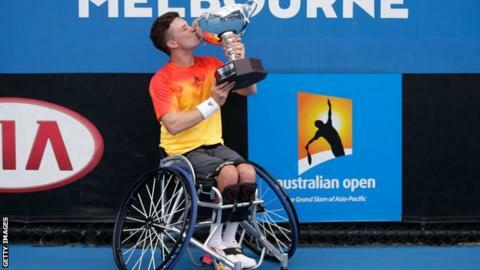 As of Saturday morning UK time Reid became the Australian Open wheelchair champion. En route, he beat his doubles partner, Shingo Kunieda, the world number one who had won eight of the previous nine Australian Open titles. In the final, Reid, ranked fifth in the world, beat Belgium's Joachim Gerard, the world number four. Reid won two doubles Grand Slam titles last year, and though he fell at the final hurdle in Melbourne, Saturday brought his first singles crown. It's not just talent or hard work that got him there. Where he is a beacon of positivity and a hugely inspiring figure - not just for our kids but for everyone - is his strength of character in the face of cataclysmic adversity. Reid is only 24. As a six-year-old he fell in love with tennis. At 12, he contracted a neurological condition in his spine called transverse myelitis that put him in hospital for six months and in a wheelchair for the rest of his life. Before he had even left hospital he had started thinking about competing as a wheelchair tennis player. Twelve years old, remember. Twelve! In an interview last year he spoke of his mindset. "You can focus on what you can do instead of worrying about things you can't do and what's been taken away from you," he said. He spoke of his "dark moments" and "periods of my life where I was quite down and finding it quite hard, but I think tennis has definitely been a big help to me and helped me overcome a lot of the hurdles that have been placed my way. It was just about making the choice of not letting the condition defeat me and just trying to turn things back around." As glorious as his game is, his words are just as powerful. Reid is a beacon of brilliance and, yes, a role model, in every sense. Jordan Rhodes is on the cusp of a move up the pecking order of the Championship, from Blackburn in 18th place to Middlesbrough in second. For the privilege of having one of the division's most consistently prolific goalscorers at their club there is a fee of £9m Middlesbrough seem only too happy to pay as they push for promotion. When you factor in the £8m Blackburn paid Huddersfield to bring Rhodes to Ewood Park in 2012 that's £17m in transfer fees on a player who turns 26 next week. The money involved is hardly a surprise. Rhodes is a predator of renown in the Championship. In his three full campaigns with Blackburn he has never been lower than second in the league scoring table at season's end. It begs a couple of questions. Firstly, why isn't he already playing in the Premiership? Secondly, why is he such an irrelevance with Scotland? In the time that Rhodes that has been at Blackburn, many of the strikers who have gone from Championship to Premiership have done it via promotion rather than transfer. No Premiership club took a gamble on Leicester's Jamie Vardy while he was in the Championship. No Premiership club signed Charlie Austin or Troy Deeney or Odion Ighalo or Danny Ings while they were in the second tier. They all had to reach the top by getting promoted into it. It was the same for the leading scorers from 2012-13 and 2013-14, Crystal Palace's Glenn Murray and Ross McCormack of Leeds. The latter is still in the division with Fulham. Daryl Murphy was the main man last season and he remains at Ipswich, though at 32, his age would have counted against a move upwards. There are exceptions, but mostly there seems to be a heavy reluctance on the part of Premiership clubs to dip into the Championship in search of strikers. That's one reason for Rhodes not already being there. The second - and we hear this a lot - is because he has flaws in his game. His hold-up play isn't good enough. His game management is not strong enough. He has technical deficiencies that are holding him back. He can't play the lone striker role. We hear this mostly from Scotland managers. Craig Levein, in the first instance, and now Gordon Strachan. It's been beyond the wit - or the inclination - of both to give Rhodes a proper shot. Rhodes scored 87 goals in 148 games for Huddersfield and 83 in 169 for Blackburn. With Scotland Under-21s, between September 2011 and May 2012, he played six competitive matches and scored eight times. Scotland were unbeaten in those six games. At U-21 international level, he's played eight games and scored eight goals. It's an all-time record for Scotland. There's no doubting that Rhodes has things he needs to work on, but he has goals in him and Strachan is not exactly blessed with people who are proficient in putting the ball in the net. He continues with Steven Fletcher, but surely, when the friendly season kicks-in and then gives way to the competitive stuff later in the year, Strachan has to expand his options with Rhodes and Leigh Griffiths and anybody else who might have been able to do something about Georgia 1-0 Scotland. Rhodes has been shoddily treated by Scotland. He made his debut in November 2011 and has won just 13 caps. It's extraordinary that Strachan hasn't invested in him. In his Scotland career - including the early days under Levein - he has started only three internationals [and has scored three times] but only one of them was a competitive match, almost two years ago. He has played 107 minutes of international football since June 2013. Maybe Strachan is right. Maybe Rhodes is unable to make the ascension to international football, but how will anybody know until he's given a reasonable chance? He hasn't been as yet. Meanwhile, Middlesbrough, in an automatic promotion spot to the Premiership at present, continue to count out the millions to secure his services.